This story started like many others before: with the need to write a recipe and take pictures, and a husband befuddled by the introduction of yet another “suspicious” Dominican dish. – “Honey, what are you cooking”. – “Something you’ve never eaten before”. I had to give him a brief explanation about the fact that what most Dominicans call “salami” only has a passing resemblance to its European counterparts. The Dominican version is closer to potted meat than the European moldy, air-dried sausage. And unlike the Italian salame (plural is salami), or the French saucisson, which is consumed uncooked in thin slices, the Dominican version is rarely preferred uncooked. As a cheap source of protein, Dominican “salami” or “salchichón” once endured a reputation that seems to have been mostl eradicated by the advent of standard industrial processes and, one hopes, tighter governmental regulations on meat sources. The biggest, most reputable brand is now owned by a British conglomerate. You can enjoy your salami with relative peace, mindful only, I assume, of the fact that like other similar meat products it is not exactly the healthiest choice one can make. But, una vez al año no hace daño*. And thus endeth the lesson on this Dominican comfort food, with Bo learning another piece of Dominican food trivia, and me being aware of how lucky I am that, although not sharing my cultural heritage, my husband is fairly open to trying anything. Plus it looked good, very good, one has to admit. * Once a year is not harmful. 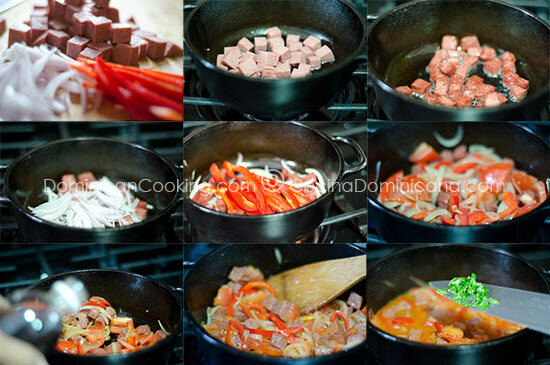 Salami Guisado Recipe (Dominican "Salami" Hotpot): one of the most humble Dominican dishes, truly a poor man's delight. Pure comfort food. Cut the salami into cubes. Heat the oil over medium heat. Add the salami cubes and cook and stir until they brown. Add the onion and cook and stir until the onions become translucent. Add the bell pepper and cook and stir for a minute. Add the tomatoes and lower the heat. Simmer until the tomatoes soften. Stir in the vinegar and tomato sauce and water and simmer over medium heat for 5 minutes. Add the parsley, season with salt and pepper to taste (I didn't use any extra salt) and remove from the heat. Serve with boiled yuca (cassava) or mangú. Hi tia. Let me tell you that I am always on your website and cooking dinner and lunch with your recipes. The only complaint I have is the 3 years ago I learned with you website, Of course, how to make a “pastelón de plátanos maduros” and since then my gringo esposo love it y no me deja tranquila and I have to make it at least once a month..:) . For real Tia.thank you very much me salvaste con tus recetas. Thanks, I am glad to know we could be of help. Amazing quick go to meal! yummy making this for lunch this week. Haha, last night I was chopping some salami to make salami guisado & my husband peeked into the kitchen & said ‘Are we having ‘man-goos’?’ He was so excited. I wished I could find some yuca, I love salami guisado with yuca. Yummy! Uno de mis platos favoritos! Que bueno es ser DOMINICANO, jijiji! I googled ‘what to make with salami’ and every post said sandwich which the most obvious thing.. This is the absolute best stew ive made with salami. I added some spices other than salt & pepper & used a few different ingredients like coriander instead of parsley and wine vinegar instead of fruit vinegar an added fried the salami with honey..too good! My mum is a great cook and my biggest critic. Her head hit the pillow after eating this! Absolutely beautiful. Thanks aunty Clara!